| without a master; but, at about twenty years of age, he went to Rome, where he continued the pursuit of it under father Benedict Castelli. Castelli had been a scholar of the great Galilei, and had been called by pope Urban VIII. to be a professor of mathematics at Rome. 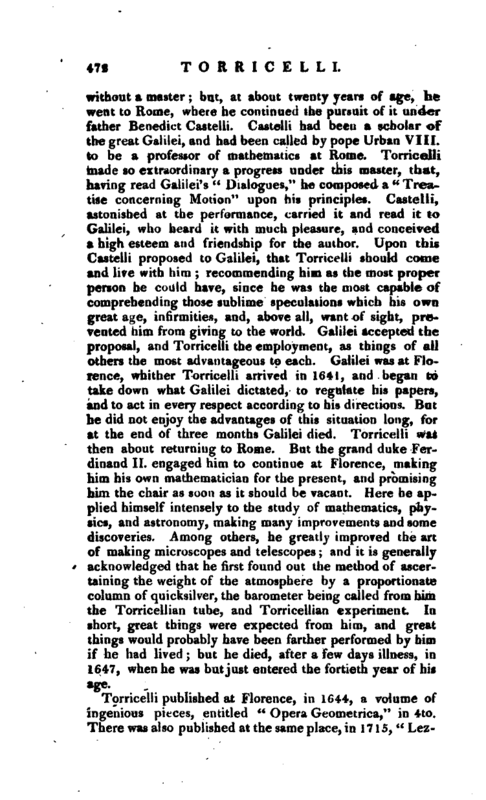 Torricelli made so extraordinary a progress under this master, that, having read Galilei’s “Dialogues,” he composed a “Treatise concerning Motion” upon his principles. Castelli, astonished at the performance, carried it and read it to Galilei, who heard it with much pleasure, and conceived a high esteem and friendship for the author. Upon this Castelli proposed to Galilei, that Torricelli should come and live with him; recommending him as the most proper person he could have, since he was the most capable of comprehending those sublime speculations which his own great age, infirmities, and, above all, want of sight, prevented him from giving to the world. Galilei accepted the proposal, and Torricelli the employment, as things of all others the most advantageous to each. Galilei was at Florence, whither Torricelli arrived in 1641, and began to take down what Galilei dictated, to regulate his papers, and to act in every respect according to his directions. But he did not enjoy the advantages of this situation long, for at the end of three months Galilei died. 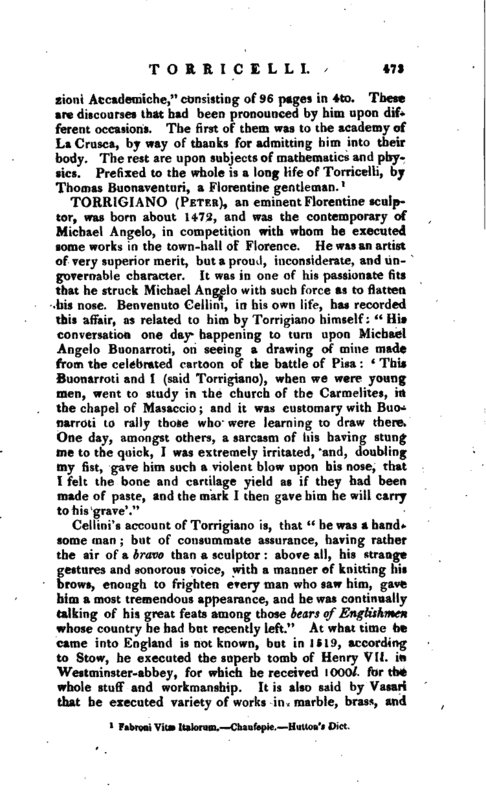 Torricelli was then about returning to Rome. But the grand duke Ferdinand II. engaged him to continue at Florence, making him his own mathematician for the present, and promising him the chair as soon as it should be vacant. Here he applied himself intensely to the study of mathematics, physics, and astronomy, making many improvements and some discoveries. 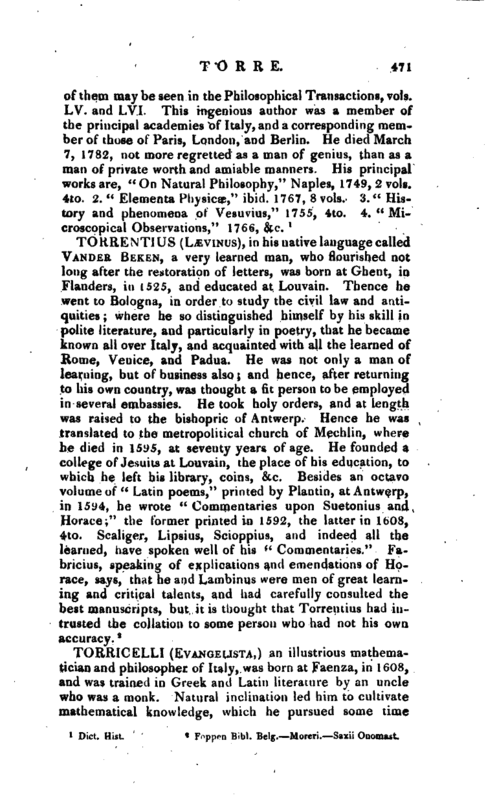 Among others, he greatly improved the art of making microscopes and telescopes; and it is generally acknowledged that he first found out the method of ascertaining the weight of the atmosphere by a proportionate column of quicksilver, the barometer being called from him the Torricellian tube, and Torricellian experiment. In short, great things were expected from him, and great things would probably have been farther performed by him if he had lived; but he died, after a few days illness, in 1647, when he was but just entered the fortieth year of his age. 1 Fabroni Vitae Italorum. —Chaufepie.—Hutton’s Dict.